April has not been a walk in the park; it's been a tough month for me and many people I care about. So it was good to have a day's leave yesterday and get out and take some pictures. I've been doing a lot of experimental pictures recently; long exposure blurry pictures and more layered pictures, so I took the opportunity to explore some more. For a long time now I've been curious about our perception of space and time, and I've been trying to make images that capture multiple viewpoints. One essential part of my work is to create images in which I move around my object, rather than just moving the camera from a fixed position. A long exposure picture of a tree that has just burst into colour. These are comforting words. If you have a passion, and time and resources to follow it, then fine. But few of us have the luxury to be monomaniacal; we have constraints of family, work, location and money that are at odds with having a passion. And the world seems just so big and interesting to have a singular interest. So it’s good to have our curiosity affirmed, something we can all live with and nurture. Last week, whist working from home one morning, I could hear the sound of nearby chainsaw. Standing on the patio I watched a tree surgeon climbing around the massive beech tree that stood two properties to the west of our house. Some of the lower boughs had already been removed at this point. Although these huge branches were the lowest on the tree, they were still higher than two storey house in whose garden it stood. This massive tree has been a double curse for us. For most of the year it eclipsed the sun and left our garden in shade in the late afternoon and evening. In the autumn it dumped untold leaves on the lawn and flowerbeds. Now it has gone, reduced for the most part into tons of wood chips. If it ever stops raining I'm going to sit outside one evening and watch the sun go down for the first time since we moved here. So these pictures made last week are the last images that I took of that tree. Made without knowing its fate. I've been experimenting with intentional camera movement and in-camera multiple exposure techniques recently, to blur and smear my images. I find I'm all fingers and thumbs at the moment, and it’s hard to create anything that captures the ideas and feelings that I'm trying to express. But it’s worth persevering because when it works well it can create images that seem to combine the emotional charge of painting with the magic of photography. I only recently wrote about how long it takes to make a joiner, and then I went and did it all again. this one, of local beauty spot Farley Mount was made back in September. Except, this one took longer and had more source material than any other that I had made previously. In fact I shot almost six hundred frames in the space of an hour for this picture. I must have spent more than a day printing the cells, cutting them out building the foreground and then the sky, then recording the sequence and then building the digital composite in Photoshop. Building the joiner with small printed cells is fun and interactive. 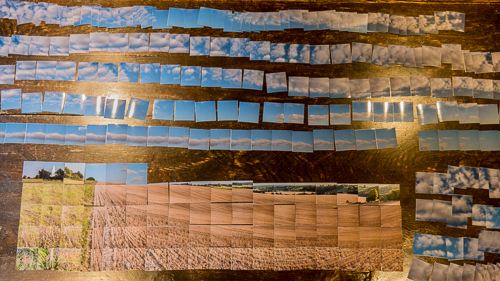 I find that making compositional choices is easier with physical photos than doing it in Photoshop. Once I've made the layout I turn the cells over one by one and record the numbers of the cell on a grid that matches the dimensions of the photo. I then use this for building the joiner within Photoshop. Each time I make a joiner I develop the method a bit further, to try to make the process easier and more repeatable. But that's for a future post. I don't think of myself as a landscape photographer, but more as someone who takes pictures of things. It just happens that the countryside is just a great place to take pictures, even if I'm most interested in man's mark on nature and the land. I know I do go on about it, but when the weather is good in September it can be spectacular, as it was this weekend. I was out scouting for ideas to help me make a new joiner, but the best images I made where simple ones that just celebrated the glorious light. This simple silhouette was made with the 20mm lens at full aperture, which helps to convey the depth of field. In an interesting interview about art and emotion on a Philosophy Bites podcast, Jesse Prinz makes a case for art being the creation of works intended to give a sense of wonder to the audience. This, for me, is as good a definition as any I have heard, working for any medium or genre. It also works as a signpost or instruction for the artist, and yardstick to measure a work of art. There are wonderful things to see all around us; it is up to us to be receptive to them. But when we do, we are fortunate that we have a device to capture these revelations: our camera, the wonder machine. I have been photographing our allotment for three years now and it remains one of the most interesting and rewarding places to make images. There are endless subjects that act as metaphors for the cycle of life, human ingenuity and the dominance of time and nature. To make the project consistent I have kept the technical aspects of the work simple. The images are all square, and all pictures shot on the 20mm lens for normal vision, or occasionally on the 45mm for a more focussed view. I’m prepared to try all sorts of different techniques in-camera and during editing but it is hard to beat the clarity that you can get with a normal lens when you have good light and the composition comes together. So it was on Sunday, when I had some time to make a few more pictures for the project. Despite the tiny size of the LCD monitors on our cameras, it is amazing how the image on it will suddenly ‘pop’ when the composition and lighting are right. It is such a satisfying feeling; you know that you have a ‘keeper’ that will find its way into a portfolio or collection. In a popular TED Talk, Brené Brown talks about vulnerability as part of the creative process. I certainly felt vulnerable the other night as I completed my entry for the 2015 LensCulture Emerging Talent Awards. Questions boiled up as I submitted the work. Is my work good enough? Have I selected the optimum group of pictures? Do they hang together as a narrative? Do they work together visually? Are they consistent from picture to picture yet showing sufficient range of subject and approach? Despite all the time spent taking, editing, revisiting and sequencing the pictures, the voice in my head answers ‘no’ to all of these questions. But you can’t let the work mould and fester unseen. If the pictures were worth taking in the first place then you need some feedback and critique. Preparing for an exhibition or a competition is one way of forcing yourself to look really critically at your own work. But actually getting your work out there in front of others is the moment of truth, when dislike, indifference or perhaps approval are responses that might await. I am under no illusions; I believe that the work needs to be seen, but there is so much good work around that my chances of success are vanishingly small. In fact, I had not planned to enter until I saw that the organisers were offering feedback, online, to all entrants, and had some examples given to previous entrants. It was this opportunity for unbiased critique that prompted me to enter. Without honest, open criticism you don’t know where you are. You are at sea without a compass bearing. It is so hard to get an honest critique, mainly because it is so hard to give. But here was an opportunity to put my work in front of knowledgeable experts who might give me that marker point. So I swallowed my pride, gathered the work together and submitted the work. And went to bed feeling very vulnerable. Last Saturday was a bit of a treat; a reunion in London with old friends and before that, an opportunity to catch some exhibitions. I was keen to see David Hockney’s latest works involving photography and painting, the multi-layered images of Idris Khan, and the latest work of Julian Opie. It was only a couple of days before my London visit that I became aware of the Julian Opie show at the Alan Cristea Gallery in Cork Street. Jonathon Jones had written a glowing five star review in a near-full page review in the Guardian, which was enough to tempt me to an earlier train to get to the exhibition on time. Jones was right on the money; Opie is a genius and this is an unmissable show. It is hugely enjoyable, fun, clever and thought provoking. His work, if you are not already familiar with it, is characterised by extreme simplification of subjects, thick bold outlines and highly economical blocks of posterised colour. You could dismiss them as cartoons, but it is the accuracy of the retained features and nuance of gesture in his subjects that makes his work true art. The images are unashamedly modern in style and execution, but pay homage to past masters. The stop-motion horses of Muybridge, Renoir’s Les Parapluies and Hiroshige’s landscapes are acknowledged in a 21st century interpretation. Opie proves his interest in our ways of seeing by using all sorts of technologies, most notably the use of motion lenticular printing. I remember getting my first lenticular postcard as a child; it was a promotion for 2001: A Space Odyssey and being fascinated by apparent depth of the diorama in the card. Opie turns this novelty into artistic expression by exploiting the ability of this technology to show short motion clips. Walk around the image and the subject walks in place. Rotund figures plod through their frame, others stride purposefully along. In other pictures boats bob on unseen waves, carp glide past each other and butterflies float on the breeze. It is a Harry Potter world in which pictures come to life. I half expected to have a Pete and Dud moment where ‘the eyes follow you around the room’. The nature of Opie’s work means that the craft of the art happens in the design, inside the computer. The physical realisation of the art is a technical manufacturing process. Here fine art becomes as reproducible as photography; an art of its age. The prints are as smooth as photographs; the galloping horses are machine cut from brilliant blocks of acrylic. Lenticular prints are subcontracted out to a company that might be producing advertising material after creating Opie’s artworks. Alan Cristea has set up an online shop to sell affordable Opie products; lenticular postcards, flip books, mugs, catalogues. This begs the question, is this affordable art or is this merchandising? And secondly, in today’s world, does this matter? A couple of months ago I received an email from Google warning me that my website was not mobile friendly and, as such, would receive lower rankings in searches against websites that do have this facility. If I’m honest, the website was not really very friendly to anybody, myself included. It was difficult to build, maintain and most important of all, was hard to update. So I let it fester until it became obsolete. Friends and family told me that it was difficult to find the images that they wanted to show others and the design looked stale. On the other hand, running my blog, Joined Up Pictures, on Blogger, was fun and easy. Even when you have had very little feedback from readers for a long while, it is still a satisfying exercise to put pictures and words together to create a new post. Once I had decided that a change of website was needed, I started looking at web hosting companies to see what would meet my needs of affordability, modern design, mobile ready and ease of construction and updating. If I’m honest, there was only one company that I wanted to use: SquareSpace. SquareSpace sponsor some of my favourite podcasts (99%invisible, Radiolab, Answer Me This) and it seemed like good karma to use them in return. With a bit more research I realised that SquareSpace was my best choice even ignoring this bias. Building the new site was much easier than the original. Having chosen a site template it’s all drag and drop, and you always see the effect of your changes rather than having to generate a preview. The layout is very clever in the way it reconfigures depending on whether the viewing device is a phone, tablet or desktop. The default styling is very clean and contemporary so I’ve used that unmodified. I’m really pleased with the way it has all come together, and I hope you like it too. I’d be grateful for any comments, both positive and negative. So grahamdew.com has a new virtual home in Brooklyn NY, but I can only guess where the physical server that holds the bits and bytes resides. Although I’ve been very happy with Blogger as the home for my blog, I’ve now consolidated the blog within the website, so from now on all future posts will be here on grahamdew.com/blog. The blog will remain the place where I will show my latest pictures and share thoughts and observations. In addition the site has a gallery of recent work, which will show you my latest pictures in glorious full-screen mode should you wish. My plan for the new site is to focus on sharing my work and development with others, rather than making a fixed statement. I want it to be more of an open workshop than online brochure, if you will. With the blog and Recent Work gallery there should always be something fresh to look at. I have plans to extend the content over the coming months, but for now it’s time to go make some art! Is it possible to capture the pleasure of walking in the countryside that in some way conveys the sense of travelling, the journey? Can this be done photographically other than a specific snapshot of some point en route?
. It is a book examines the pleasure and culture of walking, of journeys made through the country. Words can convey a palpable sense of movement and journey as they offer up a stream of mental images and ideas. David Hockney produced some fabulous high-definition moving video joiners taken on a slowly moving Jeep for his Bigger Picture show at the RA in 2012, but unlike his photo joiners, this technique is probably beyond the scope of anyone who isn’t David Hockney.
. Because every cell in his Still Films is shot from a different viewpoint, his pictures are inextricably linked to walking. It is an essential feature of his images that hold the viewer’s attention. 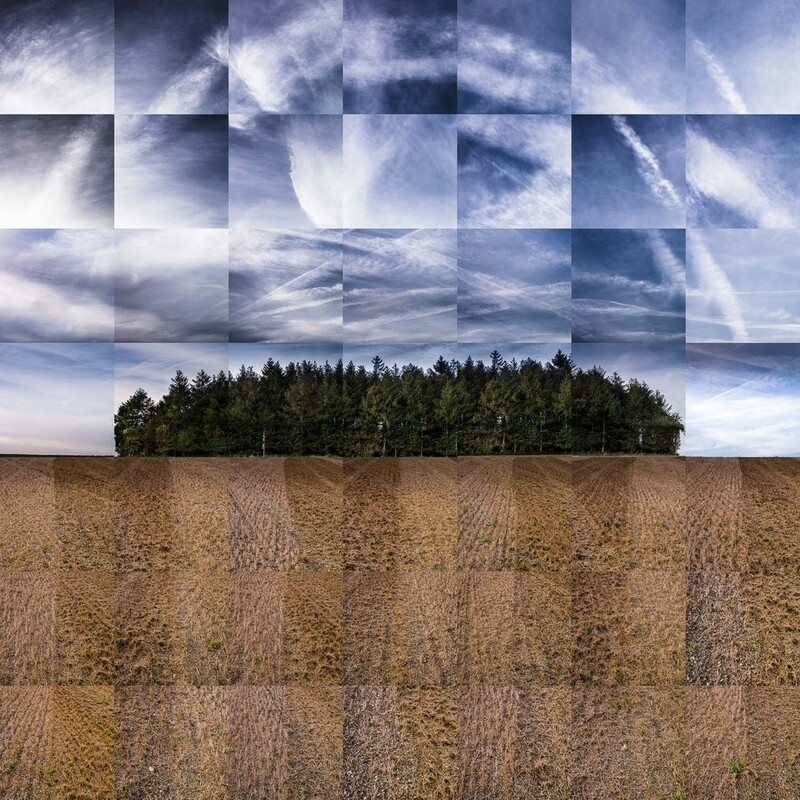 As I have been experimenting with layered images recently, I have been playing with the idea of a sequence of images that when superimposed would convey a sense of movement along a path and through the woods. The first image at the top of this post was taken a couple of weeks ago one bright evening. Frames for the picture where taken about half a metre apart, with small adjustment to the zoom to maintain the size of the path in the middle ground. I’m not entirely comfortable with the ‘Zoom’ effect that this has produced. in mind. His compositing of Bernd And Hilla Becher's houses and water towers used the repetition and reinforcement of near identical compositions. So in these two later images I shot frames every time the view was reasonably similar, often tens of metres apart. I feel that these pictures are not as successful as there is a lack of strong shapes. Maybe this might be more effective later in the autumn. But I’m not going to wish the summer away. With the fine weather it’s time for more experiments and more subjects. I have been out doing a lot of experimental photography, which has been both fun and interesting.With a new computer and the latest versions of Lightroom and Photoshop I have plenty to think about and work on. More new work to come shortly. New York’s Metropolitan Museum of Art is simply stunning. It would take a couple of hours to walk around if it were empty. As it is, it is packed full of many of the most significant works of art from every part of the world, every genre and of every age. The advice we were given was to focus on just one period or style. Of course, one wants to look in detail, as well as experience the scale of the place. So to experience the breadth of the museum, we first took a tour to introduce us to the The Met, and another to look in detail at some of the impressionist and post-impressionist works. Both tours were led by experienced, knowledgeable and passionate guides that brought the works to life and made us hungry to go explore further afterwards. We only had one day available on our whistle-stop tour of NYC, but came away with plenty of reasons to go back again sometime in the future. For all of the towering glass and steel in Manhattan, visiting Liberty Island, the Statue of Liberty and then Ellis Island is profoundly moving. To think of the millions who travelled from old world poverty and persecution to new world hope, and would have seen this statue as they travelled through this fountain-head of America. They would have looked upon Liberty as a symbol of their hopes and dreams and their new homes beyond. Some 80% of all Americans have a relative who passed through Ellis Island; it is an amazing story of how a country grew to its pre-eminence today. , and I've thought that I might try this method to capture the trees. Friel is also an exponent of long-exposure, intentional camera movement images. I've tried this before, and I've not really enjoyed it. As soon as you hit the shutter you are shooting blind. Getting a good image is largely a matter of serendipity, and it's all a bit too much hit-or-miss for me. His multiple exposure images are made in-camera, but my G3 does not have this feature so I've not really given the method much consideration. , which was the inspiration for these new images.